The Hapag-Lloyd Cruises ship HANSEATIC has just covered more than 4,000 nautical miles. The expedition ship successfully sailed through the legendary Northwest Passage. This cruise with a duration of 26 days started on 16 August in Kangerlussuaq/Greenland, passed Disko Bay, which is famous for its icebergs, and sailed through the Northwest Passage headed for Nome, Alaska. Besides numerous animal encounters and excursions with the manoeuvrable Zodiacs, the highlight of the voyage was a meeting with the sister ship BREMEN. On 23 August 2010, the HANSEATIC began the transit through the Northwest Passage near Resolute Bay, concluding the passage on 6 September 2010 upon arrival in Barrow/ Alaska. Only a very limited number of passenger ships accept the challenge of sailing through the entire Northwest Passage from east to west. The two Hapag-Lloyd Cruises expedition ships BREMEN and HANSEATIC are among the very few ships worldwide capable of tackling these routes thanks to their special constructional design and the highest ice class for passenger ships (E4). Naturally, the weather and ice conditions in this region also have an impact on the itinerary – after all, this is one of the distinguishing features of an expedition cruise. 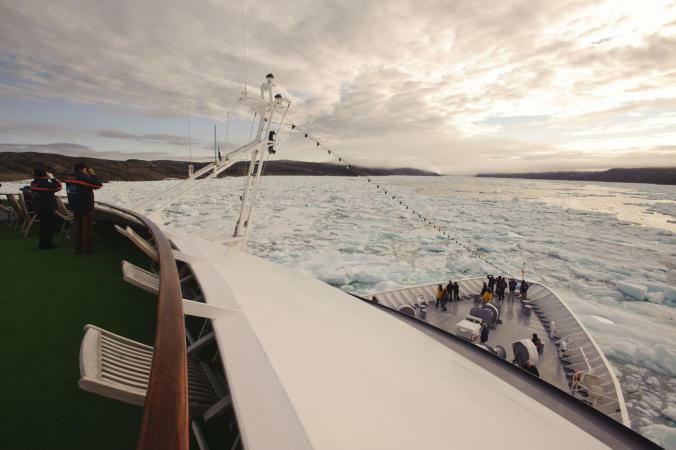 For the first time ever, Hapag-Lloyd Cruises offers guests to discover the fascination of the Arctic and the Northwest Passage on a shorter, 19-day cruise with MS HANSEATIC. Sailing through a smaller portion of the Northwest Passage, guests will follow the traces of Amundsen and Franklin and explore the ice coast of Greenland as well as the untouched island world in the north of Canada. Trip logistics: from Kangerlussuaq/ Greenland to Reykjavik/ Iceland, August 14 - September 2, 2011. The full and very popular Northwest Passage will also be offered in August 2011 with MS BREMEN. The famous passage starts in Nome, Alaska amidst impressive testimonies of the Inuit culture before the BREMEN sails through the Canadian Arctic and thus the heart of the Northwest Passage, on a 25-day journey. Trip logistics: from Nome/ Alaska to Reykjavik/ Iceland, August 13 - September 7, 2011. For more information on Hapag-Lloyd Cruises’ exciting destinations and itineraries visit www.hl-cruises.com. For bookings, inquiries or to request a brochure, please look for your nearest sales agent in your country at www.hl-cruises.com, link customer service (click here). Cruise Weekly: Mix Me a Tui Tai, Darling? Cruise West: "We are working to restructure"